Except for last night when I found a box of Kraft Cheese and Macaroni hiding behind the Weet-Bix in my refrigerator, I’ve eaten pumpkin stir-fry for dinner all week. I finished all the pumpkin I had in my house by Tuesday, so I picked the one in my front yard. I finished that one so I went around the side of the house and found another. Consequently, this week has been relatively cheap. This “grow your own” thing is brilliant. I should do it more often. 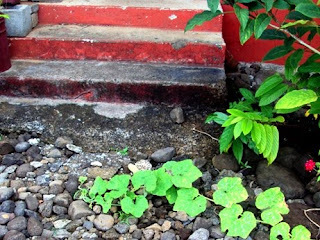 In her presentation yesterday, one of my year 12s Maryhellen pointed out Samoa is one of the “few places in the world where you can live off the food you grow.” Perhaps there are more than a few places, but she’s right in the sense Samoa is very green and fertile and plants thrive here. Spend 10 seconds in any maumaga, and you get the feeling there’s enough taro and coconuts to live there for the rest of your life. Horticulture is a traditional Peace Corps volunteer pastime. Paul and Phil have very nice gardens. Cale grows basil. I certainly have the space to cultivate a garden. With a little passion-fueled effort, I could grow all kinds of stuff back there. As it turns out, when it comes to gardening, passion and effort is where I lack. Growing up, we had a garden in the backyard that over the years yielded tomatoes, grapes, pumpkins, parsley, etc. My dad worked out in the backyard often trimming and digging and watering and clearing ivy. I picked up after the dog and mowed the lawn. I don’t completely lack a green thumb. I’m not one of those people who refuses to have a plant at the office because I’m bad at it. I can keep things alive. And it’s that much easier in Samoa with all the rainfall. I just choose not to. If I had a machete I might be tempted to go outside and hack at things and carve some sort of garden out of the dense jungle behind my house. But I don’t. And with that huge pumpkin patch that’s growing back there now, the ground is all thorny and it’s difficult to walk back there in flip-flops. So I stay in the house. As it turns out, an ignored jungle can become a beast. It used to be an easy walk around the house, but the foliage is waist high now. One of the teachers sent some students back there after school yesterday to hack some of it out. Their technique was similar to pulling up carpet. One guy hacked at the base of the plants while the other four lifted and rolled the foliage back on itself. I could buy a machete and start working back there, but at this point it would be a tough job. Hours of work every day for weeks. It would be dirty and my feet would suffer. But the pumpkin would be cheap. 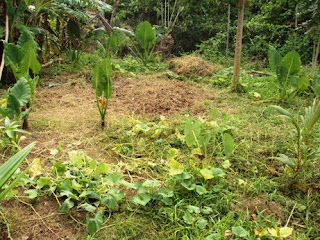 The patch in the center of the picture is the one the students cleared out yesterday. 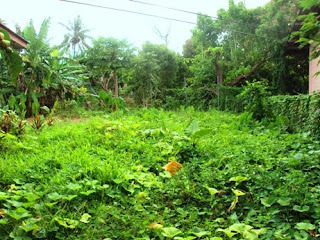 This pumpkin vine is the plant as the vines in the student-cleared patch picture above. It's huge. 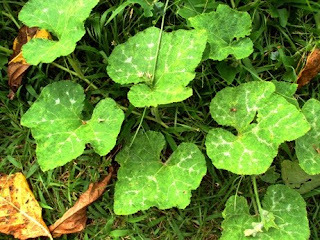 You should grow some pakalolo with the pumbkin, adds to the flavour. And realy you should eat more stuff, Guantanmo guests probably eat more than you and they dont have pumbkin jam.